Tofu is a great high-protein option for vegetarians. Adding protein to your diet doesn’t have to be a difficult challenge nowadays, especially since there are tons of fortified foods available which ensure you meet your daily recommended amount. And there are tons of foods that naturally and surprisingly boast a big protein content, meaning you won’t have to rely on consuming protein bars and shakes all the time if you are looking to up your intake. To help you determine which foods pack a heavy protein punch, we spoke to some nutritionists on the subject. Below are some foods they definitely recommend adding to your grocery list. Beef jerky is an easy and high-protein snack to eat on the go. Beef jerky comes in many flavors. “Beef jerky contains roughly 30 to 40 grams of protein [per 100 grams] (the recommended amount is 48 grams per day),” said Frida Harju-Westman, an in-house nutritionist at health app Lifesum. Harju-Westman explained that beef jerky is also a good addition to your work or gym bag as she suggested it’s an easy snack that can provide a quick hit of protein after exercise. She advised, however, reading your labels carefully, as different brands contain different levels of protein, as well as additives such as sugar and salt, which should be avoided. Tuna beats out other fish when it comes to protein content. Tuna and other fatty fish contain omega-3 fatty acids. “With roughly 25 grams per 100 grams of the fish, tuna is one of the fish foods that contain the most protein,” Harju-Westman said. In addition, tuna is also low on unhealthy fats, contains melatonin that can help you sleep better, and omega-3 fatty acids that are great for your heart, she added. Quark is a type of cheese that’s high in protein. Quark is often eaten in the same way cottage cheese is. “Quark is a complete protein, which means that it contains all the essential amino acids that your body needs,” Harju-Westman said. The protein in quark is divided into two varieties, whey and casein, depending on how it is made, she said, and approximately 100 grams of quark will contain approximately 12 grams of protein. In addition to its impressive protein content, quark also contains high levels of calcium, vitamin A and vitamin B, all of which contribute to healthier bones, skin, and even improve eyesight, she added. Tofu is great for vegetarians and vegans. Tofu is a versatile food. Tofu is a great choice for vegetarians clocking in at eight grams of protein per 100 grams. Tofu is also a fantastic source of manganese, Harju-Westman told INSIDER, which is important for strengthening your bones. Tempeh is a great addition to a meal. Try throwing tempeh on your salad. “If tofu isn’t to your taste, tempeh is another soy product that contains plenty of protein,” Harju-Westman suggested. The soy product has roughly 34 grams of protein per cup. Pistachio nuts are great sources of protein. While Harju-Westman said that pistachio nuts are quite high in calories, she also said that a handful of pistachio nuts will provide you with [roughly] six grams of protein, as well as sodium and potassium, which are the electrolytes we lose through sweat during exercise. Eggs should be your go-to for protein. Eggs are a great choice at any time of the day. “Eggs are extremely low in calories and contain plenty of protein, with about six grams of protein per medium-sized egg,” Harju-Westman explained. Just like yogurt, she noted that eggs are a complete protein and should be eaten cooked, as raw eggs seem to provide the least amount of protein. 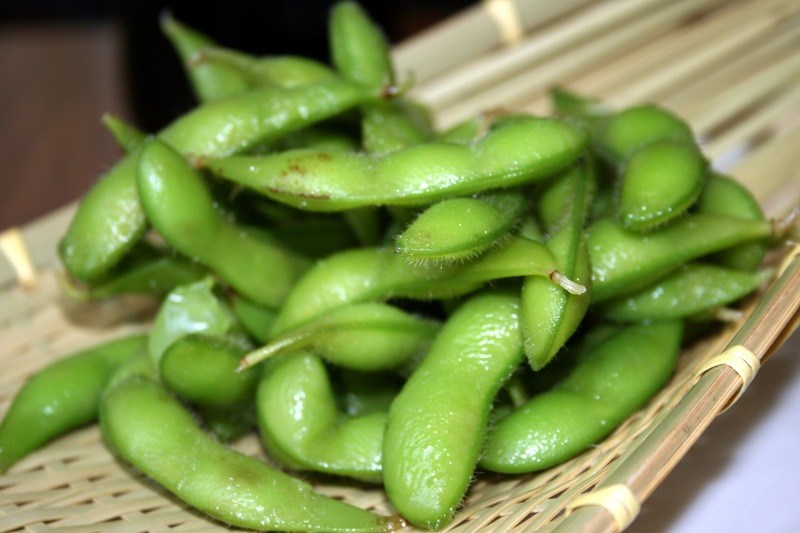 Edamame beans have both protein and fiber. They go great with soy sauce. “One-half cup of these beans has [roughly] 11 grams of protein and is a great way to cut back on animal foods while getting protein and fiber too,” said registered dietitians Lyssie Lakatos, RDN, CDN, CFT and Tammy Lakatos RDN, CDN, CFT, of The Nutrition Twins. Portobello mushrooms are low in calories and high in protein. “While most people think these veggies have very little protein, these mushrooms not only have a meaty texture but have [roughly] four grams of protein (in just 35 calories),” said Lyssie Lakatos and Tammy Lakatos. If you get your calories from portobello mushroom burgers, you’ll get lots of protein, fiber, and potassium too.